Bokoblincraft, GroovyGrevous, SuperDyl and 15 others like this. Welcome to The MeepTimes, the twice-monthly update to keep the community in the loop with what’s new, behind the scenes, and in the works. We apologize for the days being off, but this day was simply too close to the scheduled release date to resist! 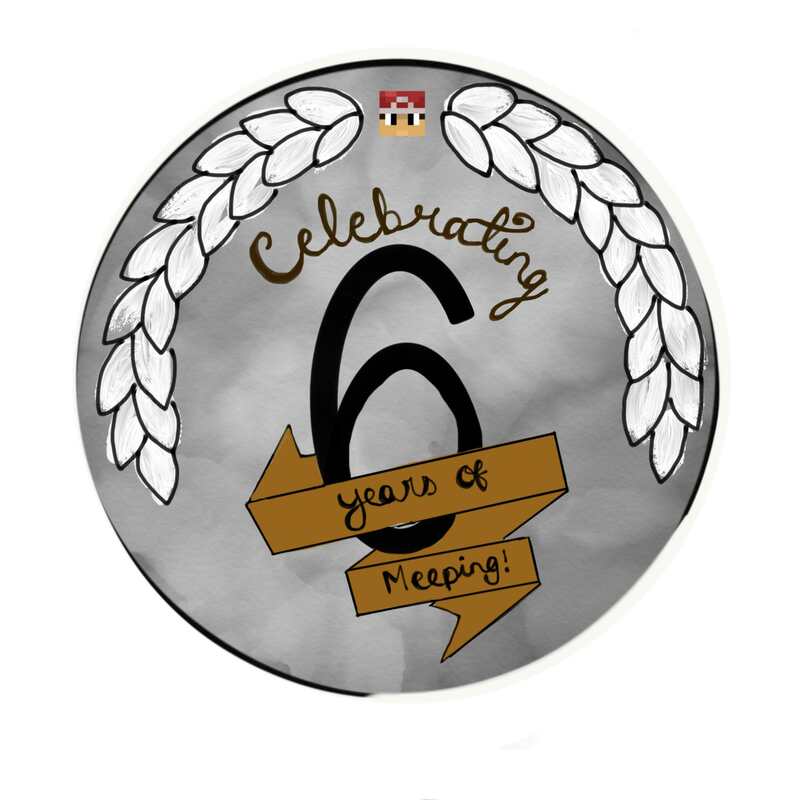 It has been a long time coming, but at last we celebrate six years of Meepcraft. There is nothing quite like it. Never fear a confusion regarding the rules on taxes again! Read about the upcoming change to town tax change rules here. Do you have a good team in Halo? Join the competition and fight to the top! Read details here, and thanks to @AdrianBFaust and @TrevinG for hosting! In celebration of Meepcraft’s sixth anniversary, a second dinnerparty was hosted by @Fuzzlr and @Cooleysworld. Fireworks lit the sky, diamonds dropped from the ceiling, and many courses of delicious . . . boats . . . were served! See images from the party here. What began as fun and games going down the waterslide at /warp waterpark became the biggest dropparty of the year so far! While @Fuzzlr was dropped dozens of gold ingots, diamonds, and other goodies, @Epixaid and @CluelessKlutz passed out Fuzzlr disguise notes to everyone in the crowd, resulting in the Second Fuzzlr Convention. See more images here! /warp hornemans was a busy place. The 6th Anniversary of MeepCraft had encouraged @Fuzzlr and @Cooleysworld to host a dinner party, with most of the online server attending. @ImPaw looked around and saw a happy, cheerful environment; diamonds being dropped, food being served and jokes being spread. Many people were there – @Proteker, @Epixaid, @MegaStufOreo, @NinjaRoxy, @OKNEM, @CluelessKlutz, even @Kling made an appearance. It was a great time for the people of MeepCraft, and no one would slow the party down. Flying down to the jungle area beside the party, he set up an elaborate redstone mechanism – dispensers, repeaters, and water buckets. He bought his materials from vShop – the quick and easy command of /buy was easily accessible to him. At last, the machine was done. He chuckled – no one was going to see this coming. Millions of gear, lost to clear lag, just like that. But someone was going to see it coming. Paw, who had been happily celebrating with everyone else, noticed something peculiar in chat – her goods on vShop being bought by Hornemans. Hornemans? she thought. Isn’t he banned? She decided to check with a mod. After a quick check, @Kling, also attending the party, found where Hornemans was buying his goods from. Teleporting in, he brought Paw with him to explore the area. This can’t be good, thought Kling. Buying dispensers, repeaters, and water buckets? There’s only one thing you can make with those three items. Paw, standing behind a tree, called Kling over. Peering out, she saw Hornemans working quickly on a machine of his devise – and Paw recognized it instantly. “It’s a TNT cannon! We need to warn everyone!” whispered Paw, perhaps a bit too loudly, as Hornemans turned swiftly to face their location. Paw and Kling suddenly hid back behind the tree, holding their breaths. Hornemans shook his head, and went back to the machine. “Okay, you go back to /warp elytra, I’ll catch Hornemans,” replied Kling. “You gonna be okay? This is Hornemans we’re talking about,” expressed Paw, clearly concerned. Paw hastily went back to /warp elytra to warn the others. Kling, on the other hand, slowly crept up to behind Hornemans. Drawing his sword, he held it up, preparing to swing. Hornemans, sensing something behind him, instinctively drew his sword and held it up, blocking Kling’s blow. The two stepped apart, and Hornemans smiled. “You’re supposed to be banned! How did you get back in here, you bloody monster?” Kling questioned. “You already know what it is, Kling. A TNT cannon. You see those players up there?” He pointed to the party. And with that, Hornemans lunged towards the lever, to fire the cannon. “NO!” shouted Kling, diving in the way of his hand, tackling him to the ground, putting him just out of reach. The two tussled on the ground, weapons out of the equation. “You… can’t… stop… the… inevitable!” shouted Hornemans, struggling against Kling’s strength. The sword came down. Everything was in slow motion. Hornemans’ face expressed raw fear, Kling’s expressed integrity, and vengeance. Just as the sword was about to connect with flesh, another one came out and blocked the blow. Kling looked up in shock at the wielder – Cooleysworld. Kling relaxed. The others got the message – Paw had made it. He released Hornemans, still in fear, and handed him over to Cooleys. They walked a short distance and warped away. They both bolted back to /warp elytra. The party was still well under way – Fuzzlr dropping Vote Keys, Epixaid dropping tools, and Viper dropping cobble. Paw smiled. MeepCraft’s days were not over just yet. I love cats and wolves so that just had to be a part of my name. I also find puns really funny and when I renamed my account I wanted to keep that a part of it, so that’s why I chose my username. What do you enjoy the most about the server? Currently, you are a co-mayor of Mistveil. What is it like being a part of such a well-built and respected town? It’s amazing I love being part of Mistveil! Owning the modern district is so much fun as I can build to my heart's content while providing a place for players to keep all their valuables and contribute to the town. What kind of things do you enjoy outside of the server? I enjoy drawing, reading, and playing archery as a sport. What kind of things are you looking forward to both in the new year, and the sixth year of Meep? The next issue of The MeepTimes will be released January 19, 2018! See you then! OKNEM, AdrianIsEpic, SuperDyl and 11 others like this. GroovyGrevous, SuperDyl, iKitten and 5 others like this. What a great edition! Super proud of MeepTimes! GroovyGrevous, smk, iKitten and 3 others like this. Terrible quality as the video itself is terrible quality, but if you can read it's founded January 7th 2012 and still it continues to be a different day every year that the anniversary of MeepCraft falls on. onceuponajano, Pmx728, iKitten and 2 others like this. GroovyGrevous, SuperDyl, EllieEllie and 2 others like this. SpongeyStar, StarryKnights, iKitten and 1 other person like this.